The message body in the attack email contains an image that is hosted on a remote server. As shown in Figure 2, hovering over the image shows that the URL link is to an image hosted at “www.cdnakamaiplanet[. ]com” which we have reason to believe is an adversary owned domain. It is likely that the image was embedded to track if the recipient opened the email or not. This string in the header suggests that the OilRig actor is likely to have used the targeted organization’s Outlook Web Access (OWA) to send the phishing email using Firefox 36. Using information from our research in the Striking Oil blog, we know the OilRig group has conducted credential harvesting campaigns specifically by emulating OWA login sites. Based on that research and this observation, we postulate that the OilRig group gathered credentials to a legitimate user’s OWA account and logged into the user’s account to send phishing attacks to other individuals within the same, targeted organization. Also, Firefox 36 was released in February 2015; since this email was sent August 2017, we believe it suggests the actors are using an outdated version of Firefox to log into the target organization’s OWA. 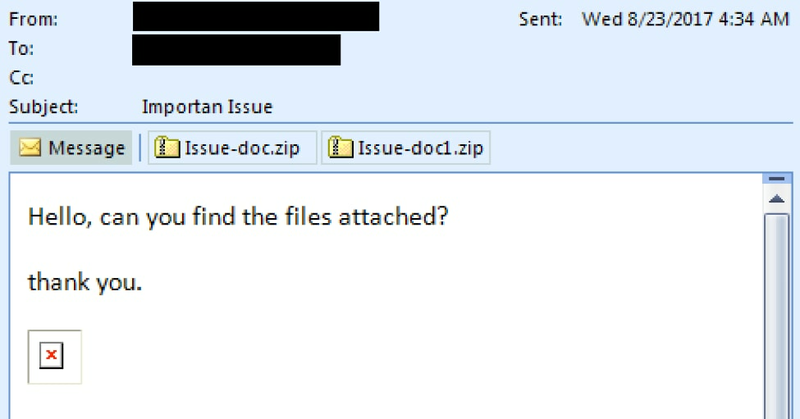 The August 23, 2017 phishing attack contained two Zip archives to the email, “Issue-doc.zip” and “Issue-doc1.zip”. Each Zip attachment contains one file, with “Issue.doc” within “Issue-doc.zip” and “Issue.dot” within “Issue-doc1.zip”. The “Issue.doc” and “Issue.dot” files are both malicious documents that will attempt to run in Microsoft Word. 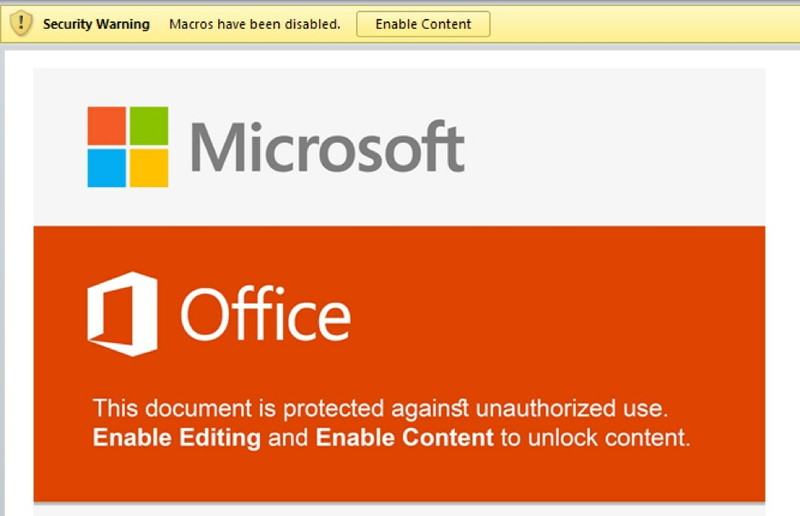 Issue.doc is a Word document that contains a malicious macro that the actors attempt to trick the victim into executing by instructing the user to click the Enable Content button as shown in Figure 3. We track this malicious delivery document as ThreeDollars. 00088200 23 23 23 24 24 24 54 56 71 51 41 41 4d 41 41 41 |###$$$TVqQAAMAAA| 00088210 41 45 41 41 41 41 2f 2f 38 41 41 4c 67 41 41 41 |AEAAAA//8AALgAAA| 00088220 41 41 41 41 41 41 51 41 41 41 41 41 41 41 41 41 |AAAAAAQAAAAAAAAA| 00088230 41 41 41 41 41 41 41 41 41 41 41 41 41 41 41 41 |AAAAAAAAAAAAAAAA| ..snip.. The macro runs a PowerShell command that will decode the contents of the %APPDATA%\Base.txt file and save it to the file %PUBLIC%\Libraries\servicereset.exe, which it will then execute. The “servicereset.exe” file is a new tool in OilRig’s arsenal that we call ISMInjector, which we will discuss in detail in the next section. As displayed by the code example above, Index.dot file attempts to load a malicious exploit document hosted at “msoffice-cdn[. ]com”, which is the same URL that hosted the exploit document used in an attack that ClearSky published on August 28, 2017. By correlating artifacts found in Index.dot, we discovered another sample attempting to exploit CVE-2017-0199 used in a separate attack, this time using “office365-management[. ]com” as the C2 domain. The resulting payload from this related delivery document is an ISMAgent Trojan that is configured to use “msoffice365update[. ]com” as its C2 server. Please reference our previous blog on ISMAgent for more information on this Trojan. Ultimately, the payload delivered by ThreeDollars is a new tool that we track as ISMInjector. As its name suggests, ISMInjector is a Trojan that is responsible for injecting a Trojan into another process. The payload embedded within the ISMInjector sample delivered in this attack is a variant of the ISMAgent backdoor that we had discussed in detail in our blog discussing a targeted attack on a Saudi Arabian technology company. The two resources that contain commands that ISMInjector uses for persistence are named “Tsk1” and “Tsk2”. The specific commands within each of these resources are within Table 1. At a high level, the“Tsk1” command creates a scheduled task named “ReportHealth” that is meant to run a payload saved to “%localappdata%\srvHealth.exe” every 4 minutes. The “Tsk2” command creates a scheduled task that runs every 2 minutes that is responsible for saving the payload to srvHealth.exe. This task saves the payload to this location using the “certutil” command to decode the original payload saved to “srvBS.txt”. The main function within the ISMInjector assembly uses the Joiner module to construct the final payload and the Inner module to inject the final payload into a process. Figure 4 shows the ISMInjector’s main function that uses the two modules to carry out its injection process before exiting. The Joiner module contains four resources named P11, P12, P21 and P22, which are all 35840 bytes of binary data. It reads the P11 and P12 resources and saves them to a variable, effectively concatenating them together. The module uses the same logic to concatenate the P21 and P22 resources together, and finally concatenates the P11+P12 variable with the P21+P22 variable, which results in the construction of a binary executable. The ISMInjector code then calls the “LoadDll” method within the Inner module, providing the string “Run”, the payload constructed by the Joiner module, and a path to the “RegAsm.exe” executable as arguments, as seen in Figure 4. The LoadDLL method constructs an embedded assembly, using the same method as the Joiner module used to construct the final payload. However, the Inner module creates another module that is used to actually perform the code injection. To create this embedded module, the Inner module references two resources named D1 and D2 and concatenates them together. The resulting .NET assembly has a class called “ClsV2” that has a method named “Run”, which is called in the LoadDll function call shown in Figure 4. The “Run” method within the “ClsV2” class is invoked to execute the payload. Table 2 contains the path through the state machines that ISMInjector uses to create a remote process, inject its embedded payload then run the payload. Each row of the table contains the current state, a description of the activities performed within that state, as well as the next state that will be set and run. The state values jump around dramatically, which requires an analyst to also jump around the code to determine its functionality. This is an interesting anti-analysis technique we have not seen the OilRig actors use in their other tools. The executable injected into the RegAsm.exe process is a variant of the ISMAgent Trojan, which is very similar in behavior to the ISMAgent payload discussed in our previous blog. This ISMAgent payload is configured to use “cdnmsnupdate[. ]com” as its C2 server using both HTTP and DNS tunneling channels. It appears the OilRig group may have simply repurposed the injection code from an open source file called DynamicCallRunPE.cs, which is available on GitHub and Codegists. The actors did not use this code without modification; instead, they used state machines as an obfuscation technique to disguise the injection code. The path that ISMInjector takes through the state machine and the activities are almost identical to the activities carried out in the DynamicCallRunPE.cs code. It is also possible that this portion of the ISMInjector was obfuscated by a crypter that the threat actors used to further complicate analysis. Beginning with the initial phishing email, we discovered a significant infrastructure for this attack wave that also showed relationships to previous Oilrig attack campaigns both from an infrastructure perspective and shared code. Much like previous Oilrig attacks, the C2 domains used typo-squatting techniques in order to attempt to evade detection. The image embedded within the phishing email is hosted on cdnakamaiplanet[. ]com, which resolves to 82.102.14.216. As with other OilRig attacks, this IP is not reused to resolve to any other domain. However, two other IPs on the same /24 netblock are found to be used as C2s. 82.102.14.222 is found to resolve to Microsoft-publisher[. ]com, which we observed as a C2 for our initial ISMAgent finding. 82.102.14.246 resolves to adpolioe[. ]com, hich appears to be a typo-squatted domain that also hosts a sample of ISMAgent at hxxp://82.102.14[.]246/webdav/aws.exe. This sample’s C2 is cdnmsnupdate[. ]com which turns out to be the C2 server for three other samples, one ISMAgent and two of them being ISMAgentInjector. Reverse resolution of this domain provides us the IP 74.91.19.122, which again is not used for any other domain resolution. Another IP on the same /24 is found at 74.91.19.108 resolving to msoffice365update[. ]com which happens to be the C2 domain for the ISMAgent payload delivered by the malicious document exploiting CVE-2017-1099 mentioned earlier in this blog. As previously discussed, the .dot file attempting to exploit CVE-2017-0199 uses msoffice-cdn[. ]com as a C2 to retrieve additional malicious code. Reverse resolution of this domain shows an IP of 185.162.235.121, which shares a /24 netblock with 185.162.235.29. This IP resolves to office365-management[. ]com which is the C2 for a secondary .dot file we were able to collect in this attack wave. In figure 5 below you can see the OilRig infrastructure for ISMInjector that our research uncovered. The OilRig group continues to target organizations in the Middle East, in this instance targeting the government of the United Arab Emirates. They continue to use the ISMAgent Trojan as the final payload in their attacks, this time in conjunction with a custom injector Trojan to assist with delivery and execution. The injector Trojan was obfuscated using a known crypter and used state-machines as an anti-analysis technique to complicate its process to inject the payload into another process. The use of crypters and anti-analysis techniques suggests that the threat actors are increasing their efforts to evade security products to successfully compromise its targets. As our research continues to expand into the OilRig group, we are continuously discovering new infrastructure which directly overlaps with previously used infrastructure. With the addition of the reuse of tools, similar attack protocols, as well as consistent victimology, we have strong confidence that the original OilRig attack campaign is indeed a single, unique, and previously unknown threat group that will hereby be referred to as the OilRig group.